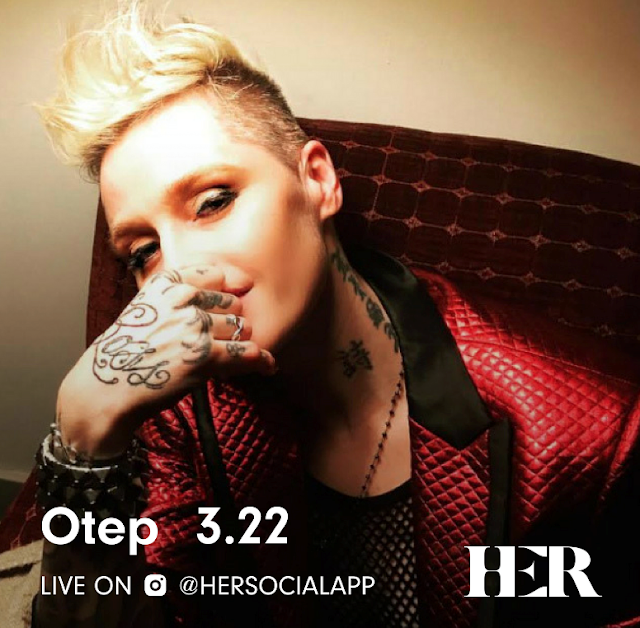 Activist-Artist OTEP Takes Over the HER Instagram Today! Although groundbreaking activist, art-rock performer, author and spoken word artist Otep Shamaya has been awarded for bringing awareness to political injustices, women's rights, and animal rights, some of her greatest strides for equality have been made in her fight for increased LGBTQ+ rights. As a member of the LGBTQ+ community herself, Shamaya is thrilled to announce that she will officially take over the HER Instagram account "Stories" today. Shamaya recently hinted at the release of her upcoming eighth full-length OTEP album, scheduled to release later this year via Napalm Records. The album will exhibit not only OTEP's proven musical talents, but will also explore topics Shamaya and the band feel adamant about, relating to activism and social education. The album promises to be a politically-charged force of expression, following in the footsteps of activism-focused recording artists like Rage Against the Machine, Woodie Guthrie and others. This is OTEPlike you've never heard them before. OTEP's upcoming album was recorded at The Lair in Los Angeles, completely utilizing the same equipment used on their first album, Sevas Tra (down to her original vocal microphone, a SHURE Beta 58), in order to create a sound reminiscent of their roots. The Lair is also where OTEP recorded Smash The Control Machine, the band's fourth release. Shamaya has gone on record saying the band's upcoming eighth album is undoubtedly the band's most authentic and honest, and regarding the lyrics, "No one is safe, no one escapes". This new album will follow OTEP's previous full-length, Generation Doom, released via Napalm Records in 2016. The critically acclaimed album debuted at #10 on the Independent Chart, #7 on the Rock Chart, #4 on the Hard Rock Chart and #109 on the Top 200 Albums Chart, according to Nielsen SoundScan. OTEP recently announced that the band will perform on this summer's Rock Fest in Cadott, WI on Friday, July 13! The 25th annual Rock Fest will take place from July 12-14, 2018 on the Rock Fest grounds and will be hosted by radio personality Lou Brutus. Disturbed, Incubus and Godsmack are slated to headline the festival, with additional performances confirmed from Rise Against, Halestorm, Seether, Black Label Society, Bush and many others. Rock Fest tickets, camping and pit passes are on sale now at http://bit.ly/RockFest2018. For additional information and a complete line-up list, visit www.rock-fest.com.